Consisting of solar panels and a portable battery charging station, Nextek Power Systems’ STAR Portable Solar Power Generator makes it possible to power structures directly or through the distribution of battery packs regardless of proximity to power utilities or other power sources. Under an exclusive manufacturing license granted by Nextek, DSA conceived and led a program to re-design, commercialize, market and deploy STAR systems through distribution and “last mile” supply chain partners globally. Utilizing the services of the DSA℠ Business Development Ecosystem Model, DSA has developed a supply chain of coordinated efforts with various contributors’ to help a Long Island Veteran and his two children whose home was devastated by super storm Sandy. Securing a $15,000 grant provided by the United Way of Long Island and an additional $10,000 in donations of time and material, the family will move into their new temporary home in early May. The donated structure is a 288 sq ft temporary Hunter Shelter that has been placed on the front lawn of the effected property in Amityville, Long Island. The Hunter Shelter is a modular and sustainable shelter system, manufactured on Long Island and is both flood resistant and Hurricane hardened and can be erected on the property of the home owner and then taken down to be reused for subsequent emergencies. The Hunter Shelter can also be upgraded with a Nextek Power Systems STAR™ Portable Solar Power Generating System manufactured by Vision Quest Lighting, on Long Island, when no grid power is available. Former Congressman George Hochbrueckner worked with the Town of Babylon Supervisor Rich Shaffer to expedite all necessary permits. The project has also gained the support of Congressman Tim Bishop, Suffolk County Executive Steve Bellone, and the Department of Labor as well. 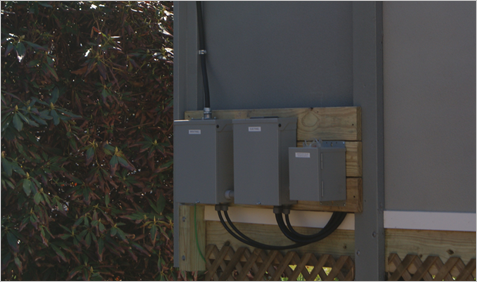 Nextek Power Systems’ power servers reduce energy costs by employing Direct Coupling® Technology to use all available energy from locally generated DC sources (such as photovoltaic cells) first, then “fills in” with power from the grid or, when the grid is not available, from batteries. The system never inverts power to AC avoiding power-robbing conversions and grid interconnection issues. DSA has an exclusive license to market and manufacture Direct Coupling® Technology in New York State. DSA has been instrumental in keeping Nextek Power Systems engineering resources on Long Island beginning with Nexteks’ participation in DSA’s inaugural Certified Sustainable Supply Chain Development Training Program. As the first tenant in DSA’s first manufacturing incubator housed at the DSA Center of Excellence within Telegence Green Engineering Solutions in Bohemia, NY, Nextek has continued perfecting the engineering of their DC Coupling System while their Emerge Alliance develops and promotes electrical standards supporting the adaptation of DC power distribution in commercial buildings from Nexteks’ new corporate headquarters in Detroit, MI. Keeping the engineering capacity on Long Island was a key component in proving the DSA℠ Business Development and Work Force Education Ecosystem Model resulting in a Nextek contract with DSA to provide product and regional supply chain development services for a component of the DC Coupling System. Focused on accelerating the growth of Nexteks business, DSA saw a retail market opportunity for a solar generating trailer Nextek engineers were developing for the IEEE Communities Solutions Initiative to provide off grid power solutions in developing nations. Employing a customized package of DSA℠ Ecosystem Model services, DSA conceived and led a program to re-design and re- brand the trailer as a Nextek product known as the STAR Portable Solar Power Generator. True to the DSA℠ Model, graduate students from Stony Brook’ University’s office for the Strategic Partnership for Industrial Re-Development continue to work with Nextek engineers gaining valuable, real world experience and an inside track to employment opportunities post-graduation. of a deployable solar panel, battery charging station and charging controller, makes it possible to power homes and small businesses anywhere, regardless of proximity to power utilities or other sources. DSA is currently marketing and deploying STAR systems in developing and developed nations through distribution and “last mile” supply chain partners around the globe. DSA is a proud supporter and member of the Emerge Alliance. can be configured and quickly deployed to meet any users’ need from its base model with 192 square feet of living space with sleeping quarters and a living area to an easily expandable 288 square foot model equipped with additional sleeping quarters, toilet, a compact kitchen; its compact kitchen is produced by Summit Appliances, with a manufacturing facility in the Hunts Point section of The Bronx, New York and a warehouse facility in Edison New Jersey; its electrical/LED lighting system manufactured by Vision Quest Lighting in Ronkonkoma, New York.